But none of the others got a rock star welcome from their communities like India's Prime Minister Narendra Modi. He packed Madison Square Garden for a sellout performance to 18,000 members of the Indian diaspora on Sunday. 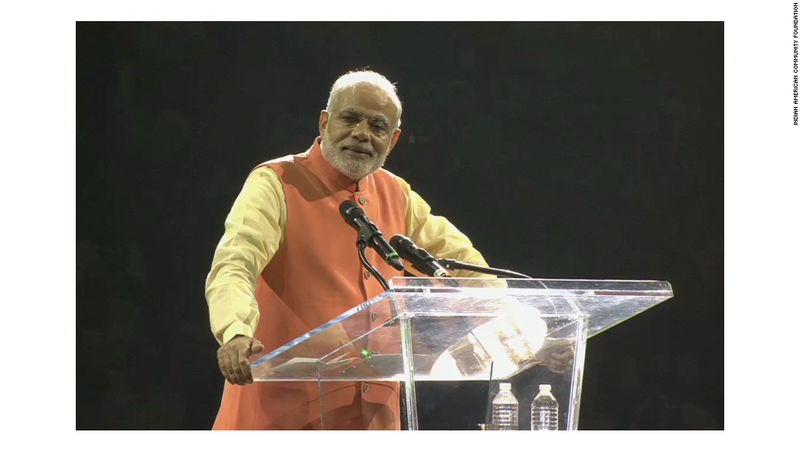 "Join me in changing India's destiny," Modi told the uproarious crowd. Modi's real mission begins Monday: Sell India hard to corporate America. He starts the day with a breakfast meeting of top corporate leaders, including Google's (GOOG) Eric Schmidt, Citigroup's (C) Michael Corbat, Merck's (MRK) Kenneth Frazier, Caterpillar's (CAT) Doug Oberhelman, MasterCard's (MA) Ajay Banga and Pepsico's (PEP) Indra Nooyi. Later in the day, another group is meeting him for one-on-one appointments. They include Goldman Sachs' (GS) Lloyd Blankfein, Boeing's (BA) James McNerney, IBM's (IBM) Ginni Rometty and General Electric's (GE) Jeff Immelt. Then he flies to Washington to meet U.S. President Barack Obama. After coming to power with a rousing mandate in May, Modi started his term by promising to fix India's government bureaucracy and roll out the red carpet to global businesses. Just this past week, he launched something called the "Make in India" campaign, where he invited companies from all over the world to make their products in India. His mission: make India a manufacturing hub. Investors have already shown excitement at the prospect of India's economic growth. The benchmark Mumbai Sensex index has increased by 26% this year. India's economy expanded at a 5.7% annual rate in the second three months of 2014, busting a long streak of unimpressive numbers. It was the strongest quarterly growth in over two years and it also marked Modi's first 100 days in office.